This cart full of groceries was just $41 from using the steps below. Baby not included :-)! I have created a Free Online class, Shopping with Coupons: A Beginner's Guide to Saving. Couponing doesn't have to be extreme if you take baby steps along the way. My goal is finding value in the products and helping you to save the most possible in this economy. Day 1, Set a Budget. Do you have a personal budget for grocery shopping and meal planning. Without a budget you won’t know how much you have to spend to even begin to save. Day 2, Get some Coupons. Learn where to find coupons. Also learn about eCoupons, insert coupons, printable coupons and more! Day 3, Organize your Coupons. Emphasized the importance of organization and offered an overview of two popular organization methods. Finding a method that works for you is the best approach to organization! Day 4, Focus on One Store. This is one of the most important tips as you start. When you focus on one store, you become an informed shopper of their policies. Day 5, Plan your Purchases. Proper planning makes shopping simple and efficient! Learn my 3 simple steps to save! Day 6, Stockpile Tips. Understand how to build your stockpile. Also, learn what I call “Penny Planning” and how that is imperative in purchasing large quantities for your stockpile at the best savings possible! Day 7, Learn to Play Drugstores. The drugstores take a little more to “get” in my opinion. Steps 1-6 help make playing the drugstores a saving success! 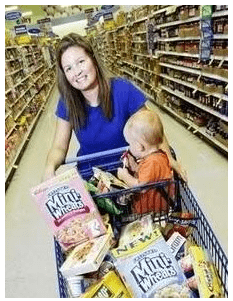 It's as simple as that – 7 Easy Steps to Shopping with Coupons! This Beginner's Guide to Saving will quite possibly change your view of a coupon from this point on! Since the day I cut my first coupon, I haven't looked back. I have saved so much (currently $6,000 one year alone) and consider it a blessing. Couponing has become second nature for me, and it will for you soon enough too! By pressing the Submit button below, I am requesting to receive the 7 Day Coupon eCourse emails and learn how to shop and save using coupons with the help of Savings Lifestyle!